Recordings of the 2019 Cover Crop and Soil Health Conference are available for viewing on the Eastern Nebraska Research and Extension channel of the University of Nebraska–Lincoln's MediaHub site. Download handouts from the 2019 conference. The 2019 conference was held on Feb. 14. 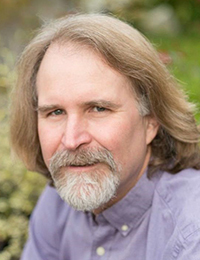 The 2019 Nebraska Cover Crop and Soil Health Conference features innovative speakers who have worked with cover crops extensively and will share what they have learned. This is your opportunity to get your questions answered. 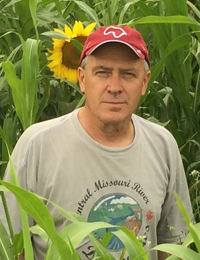 How can you get started with cover crops in your corn/soybean rotation? 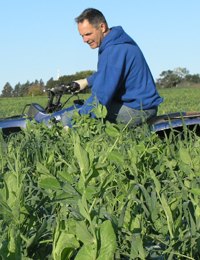 Already using cover crops - could you be doing it better? There are many benefits to utilizing cover crops, such as improved soil heath and reduced erosion. It’s the details of how and what to do that can present challenges. The focus of the conference is to provide information to growers who are in a corn/soybean rotation and to assist them in understanding the value of cover crops. CCA credits are applied for and pending approval. Growing a Revolution introduces farmers bringing degraded soil back to life through adopting conservation agriculture practices. Visiting farms in the industrialized and developing worlds the author finds that the combination of no-till planting, cover crops, and diverse crop rotations provides a profitable recipe to rebuild soil organic matter, cultivate beneficial soil life, smother weeds, and suppress pests while using far less fossil fuel, fertilizer and pesticide. Combining ancient wisdom with modern science, the book shows how regenerative practices are good for farmers and the environment, and can help feed us all, cool the planet and restore life to the land. Rebuilding and maintaining life in the soil is directly linked to the longevity and reliability of our future agriculture. Landscape simplification has been ongoing for generations fueled by loss of perennials and animal impact, combined with soil disturbance, residue removal, and monoculture crop production without cover crops. Symptoms of landscape simplification are evident and include reduced soil organic matter and infiltration, wind erosion, water erosion, salinity, water quality impacts, and high fossil fuel inputs. The rebuilding process begins with the understanding of the carbon cycle and how it relates to cropping systems, grazing systems, orchards, gardens, etc. How does carbon enter the soil and how does it leave? What is the process for carbon in the surface residue and the root mass? What role can livestock play? Soil regeneration requires the constant building and rebuilding of soil aggregates, a foundation building block of soil function. As carbon levels increase, the soil food web increases, and now has the ability to build more soil aggregates and move carbon into the soil organic matter. Ray has had wheat in the rotation since 1994 on some of his soils. In about 2000, he started planting cover crops in wheat stubble and continued to plant cover crops in wheat stubble, but not after corn or beans. The cover crops were grazed to some extent. Better soils were in a corn, corn, soybean rotation. Where wheat was raised, soil OM has been raised just over 1 % since 1994. Where wheat was not raised, the OM increased about 0.3 %. So now Ray is trying to get wheat on all soils types with a cover crop to try to improve OM in the better soils. Can OM be increased by 3 % in 10 years? He believes this would require high carbon inputs. Ray is interested in finding ways to combat resistant weeds and insects, or ways to reduce input costs so the farm stays profitable. 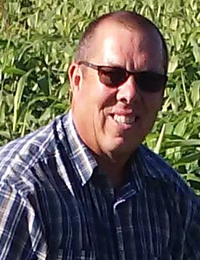 With a more “healthy” soil, he wants to reduce input costs and not depend so much on the chemical ag industry to solve cropping system problems. He believes diversity of cropping and cover crop diversity can reduce the costs. Ray believes good soil health research and measurements (field and lab) are needed to define what a healthy soil is. Jeff and his wife, Jolene farm approximately 600 row crop acres near Crofton, Nebraska, mostly in the Bow Creek water shed which dumps directly into the Missouri River. They also have 200 acres of pasture that they rent out or custom graze cow calf pairs. The farm where they grow mostly corn, soybeans, oats and field peas has been in continuous no-till for 25+ years. Jeff is a a member of the Nebraska Crop Improvement Association and grows certified oats and non-GMO soybeans for seed that he sells in their small seed business. 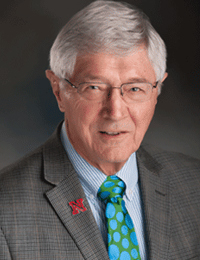 His passion for conservation has also led him to being a board member on the Lewis and Clark NRD and also the Nebraska Natural Resource Commission. About 5 years ago, Jeff started incorporating cover crops into his operation. He could see that after 20 years of no-till, his soils were not improving as much as he wanted. Erosion control and water infiltration had improved but organic matter was still basically the same. He started drilling multi species mixes after oat and peas and mostly cereal rye after corn and soybeans. He then started bringing in cattle from his brother in law’s large cow herd. Not only did this pay for cover crop costs but it helped with residue management and sped up the cycling of nutrients. He is excited at the thought of returning soils to what they once where and he’s convinced that livestock are part of the equation. The economist in him has been working at putting together the hard numbers that prove this can be done while still making a living. Being on the NRD and the Nebraska Resource Commission has also made him aware of ground water and surface water quality and quantity problems. It has also led him to believe that cover crops and animals back on the land can be a large part of the solution. In 2015, after researching benefits to soil health in multi-species cover crop mixes, Scott rented 40 acres to a neighboring cow-calf operator. Haney and PLFA soil testing showed dramatic improvement compared to fields with single species cover crops that were not grazed. Scott has since increased diversity in cover crop cocktails to 10-12 plant species with the goal of having livestock grazing on every acre annually. No fee to attend, but must pre-register. Preregistration required to ensure resource materials are available and for meal planning purposes. Seating is limited. To be added to the waiting list, email cdunbar2@unl.edu or call 402-624-8030.